The Big Sick is a Judd Apatow special. Although Apatow is accorded only a producer credit on the Michael Showalter-directed film, the movie contains the hallmarks of Apatow’s romantic comedies: a ribald, edgy sense of humor; more “real” dialogue and conversations than in the norm in the genre; a rejection of oversentimentality; and a midsummer release date. 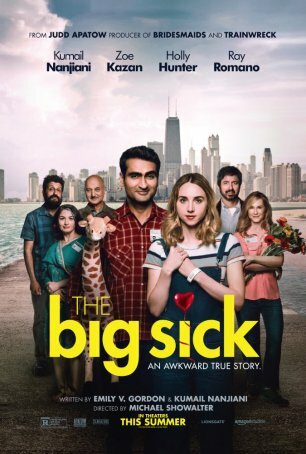 Although Apatow might be the biggest name associated with The Big Sick and it may be a good fit for his production company’s umbrella, the movie really belongs to the screenwriters: Kumail Nanjiani and Emily V. Gordon, because it tells the (mostly) true story of their meeting and unusual courtship. “Unusual” applies because Emily (played in the film by Zoe Kazan) spent two weeks in a medically-induced coma on death’s door as doctors at a Chicago hospital attempted to figure out what was killing her. Anyone who has been involved in an inter-racial relationship knows there are unique challenges and benefits inherent in the romance. Even if it was just the two principals, compromises would be necessary since, with different backgrounds, there are more discoveries to be made, more hurdles to clear. But when families become involved… Some cultures aren’t overly bothered by the thought of a favored son or daughter marrying an “outsider.” Others, however, are rigidly opposed to it and it can be more difficult for the non-member breaking through the barrier of prejudice and mistrust than a thief entering Fort Knox. Kumail and Emily understand this well; it’s the story of their relationship. For a while, as things are developing, they are cocooned in the newness where only the two of them matter. Eventually, however, they must deal with the realities of others. Emily’s parents, Beth (Holly Hunter) and Terry (Ray Romano), are open to their daughter dating a Pakistani Muslim. For Kumail’s father, Azmat (Anumpam Kher), and mother, Sharmeen (Zenobia Shroff), there is no greater sin than becoming romantically involved with a white woman. With most romantic comedies, I prefer that the main characters be given the lion’s share of screen time together. Separation rarely builds chemistry and a lack of interaction between the lovers creates an emotional distance. The Big Sick is an exception. Emily spends half the movie lying insensate in a hospital bed. This period, when she’s there-but-not-there (and which occurs immediately following the couple’s break-up over his inability to commit), allows Kumail to clarify what he feels for Emily and make some difficult life choices. It also provides him with an opportunity to meet and bond with her parents. From his acting in The Big Sick, it’s difficult to tell whether Kumail Nanjiani has the range to be a motion picture leading man but he has no difficulty playing a version of himself. He’s smart, charming, and has a self-deprecating wit. Zoe Kazan, although effectively not in half the movie, is nevertheless appealingly mousey and vulnerable when she is on her feet (and she bears a striking resemblance to the “real Emily”). She and Kumail enjoy an easy, unforced chemistry. Holly Hunter and Ray Romano are effective in supporting roles. I was especially impressed with Romano; although there’s a humorous element to his performance, there’s an underlying pain that I haven’t seen from him before. He goes deeper here than he ever did in Everybody Loves Raymond. The Big Sick contains its share of hilarious one-liners, some of which are as anti-PC as can be imagined, but the film works primarily because of its big heart and ability to engage our emotions while not turning off our brains. Too few legitimately funny romantic comedies are also smart. Both deeply personal and universal, The Big Sick is 2017’s Little Film that Deserves Great Exposure.